​FREE ESTIMATES for cleaning and repair of American and European typewriters spanning a century. CALL AHEAD for details if you like--especially if you’re coming from a distance. RIBBONS—We roll many of our own inked ribbons and keep others well-stocked. Nylon and cotton. EXPERTISE—The mechanics who run our R&M service have decades of experience. WARRANTIED—All repairs and purchased machines are warrantied. Just don't drop it. JOHN has been solving mechanical challenges all his life. A graduate of the University of Chicago, he’s happy to explain the reasoning behind any repair. If you'd rather discuss Ancient Greek history, he's game. ALAN specializes in IBM Selectrics and other IBM models and has for 47 years. It takes a special expertise–the machines have more than 300 possible adjustments and 3000+ parts. In the Eighties, he supervised a staff of 16 that serviced thousands of IBM typewriters for major corporations and State governments. MICHAEL graduated Simon Gratz High School and more recently earned a Certificate in Office Technology from the Sierra Group Academy. 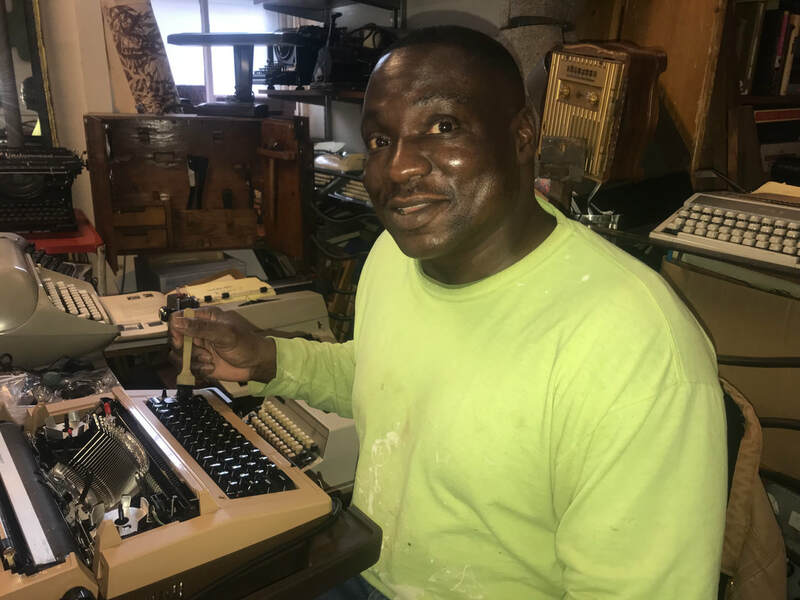 He works on both manual and electric typewriters. ELLIOTT would take apart machines and re-build them, even as a child in Lafayette Hills. After graduating Abington Friends School, he studied Historic Preservation and studio art at George Mason University before deciding he really likes working with his hands.